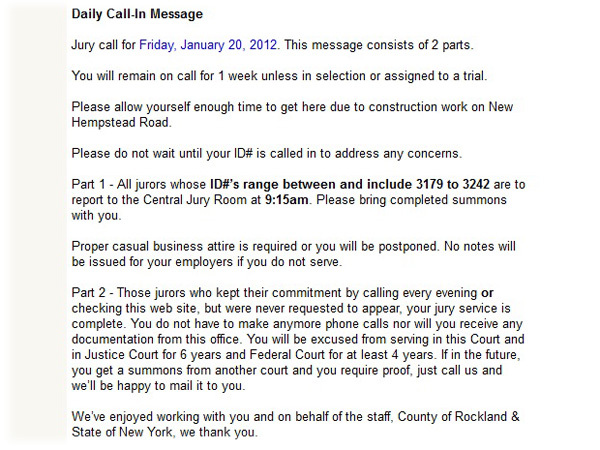 I have been on call for jury duty this past week for Rockland County’s courthouse in New City. I received the letter a few weeks ago, notifying me that I would be on call from Tuesday the 17th through Friday the 20th. Not everyone goes in on the first day – you call a phone number or check a website daily to see which jurors have to go in on each day, based on the number they assign you. I have only been called in for jury duty one time, although I did not have to go in. One of the courts in Illinois called me in, but I was already living on the East Coast, so I just had to fill out the form and state that I no longer lived in the area. Tuesday: Jurors #3001 – 3046 were required to go in. Wednesday: Jurors #3047 – 3177 were called. Thursday: No new jurors called in. 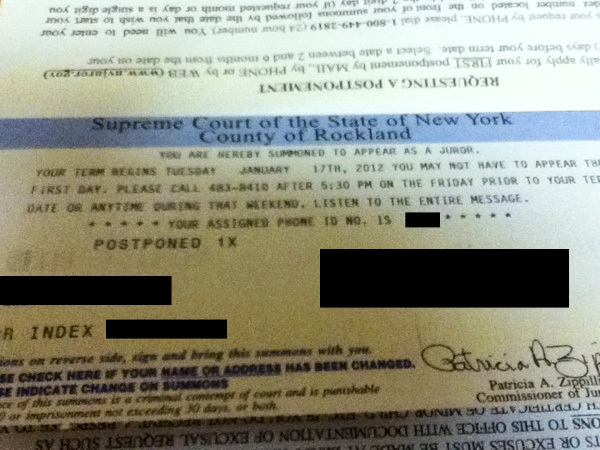 Friday: Jurors #3178 – 3242 called. As my number was in the 400s, I was relieved to read Part 2 and determine that I would not have to go in. Although I still cannot believe you get excused from a callback for 4 – 6 years depending on the court, even if you do not have to go in. I must admit it would have been an interesting experience to go to, if I didn’t have work to deal with (I have workshops scheduled for 3 of the 5 days next week to teach). But there is at least public transportation which drops you off right in front of the courthouse, so it wouldn’t have been too difficult to get to. I was informed that the Netherlands do not have a jury system, and instead that the judge does all of the sentencing. There have been some calls for a jury system in 2007 or 2008, but nothing came of it. I do find it a bit odd that the Netherlands is the only western country without a jury system. But judges are independent figures, and cannot lose their position due to sentences they pass down. Interestingly, there are no witnesses or experts at the trial, rather the ruling is based mostly on the police’s case file for the incident. Here is an interesting 2003 paper (PDF) to read: “Lay Participation in the Netherlands Criminal System” (in the 19th century) if you wish to find out more.